Methanothermus fervidus Stetter 1982 is the type strain of the genus Methanothermus. This hyperthermophilic genus is of a thought to be endemic in Icelandic hot springs. M. fervidus was not only the first characterized organism with a maximal growth temperature (97°C) close to the boiling point of water, but also the first archaeon in which a detailed functional analysis of its histone protein was reported and the first one in which the function of 2,3-cyclodiphosphoglycerate in thermoadaptation was characterized. Strain V24ST is of interest because of its very low substrate ranges, it grows only on H2 + CO2. 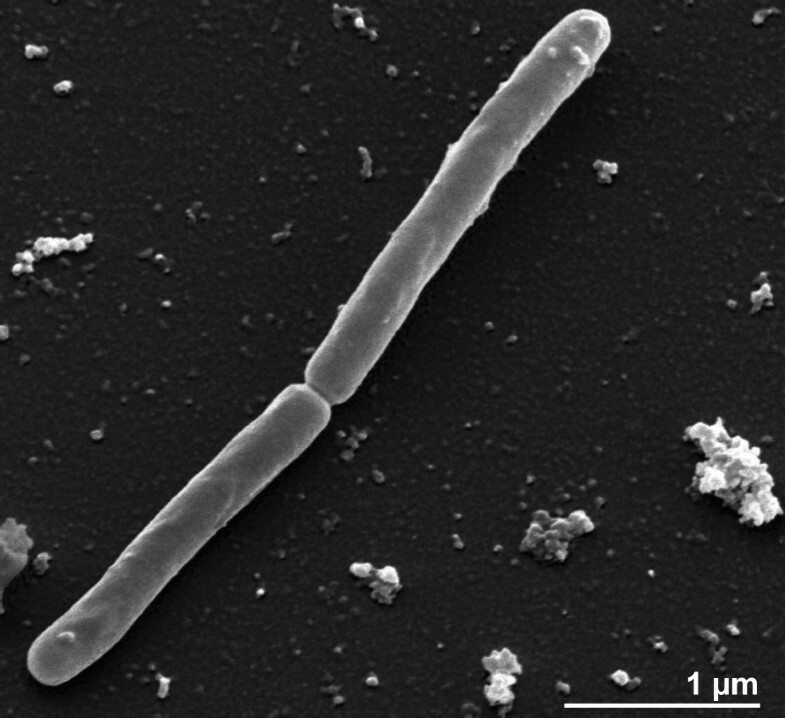 This is the first completed genome sequence of the family Methanothermaceae. Here we describe the features of this organism, together with the complete genome sequence and annotation. The 1,243,342 bp long genome with its 1,311 protein-coding and 50 RNA genes is a part of the Genomic Encyclopedia of Bacteria and Archaea project. Strain V24ST (= DSM 2088 = ATCC 43054 = JCM 10308) is the type strain of Methanothermus fervidus . Together with M. sociabilis, there are currently two species placed in the genus Methanothermus. The strain V24ST was isolated from an anaerobic Icelandic spring [1,2] and M. sociabilis from a continental solfatara field in Iceland . Since any attempt to isolate Methanothermus from similar places (Italy, the Azores, Yellowstone National Park) was without success, Lauerer et al. (1986) have speculated that strains of Methanothermus may exist endemically within Iceland . The genus name derives from the Latin word “methanum”, methane, and from the Greek adjective “therme”, meaning heat, which refers to a methane producing organism living in a hot niche . The species epithet fervidus comes from the Latin adjective “fervidus”, glowing hot, burning, fervent, because of its growth in almost-boiling water . No further cultivated strains belonging to the species M. fervidus have been described so far. Here we present a summary classification and a set of features for M. fervidus strain V24ST, together with the description of the complete genomic sequencing and annotation. The original 16S rRNA gene sequence of strain V24ST (M59145) shows 92% sequence identity with the 16S rRNA gene of M. sociabilis (AF095273)  (Figure 1) and 88% identity with an uncultured clone, NRA12 (HM041913). 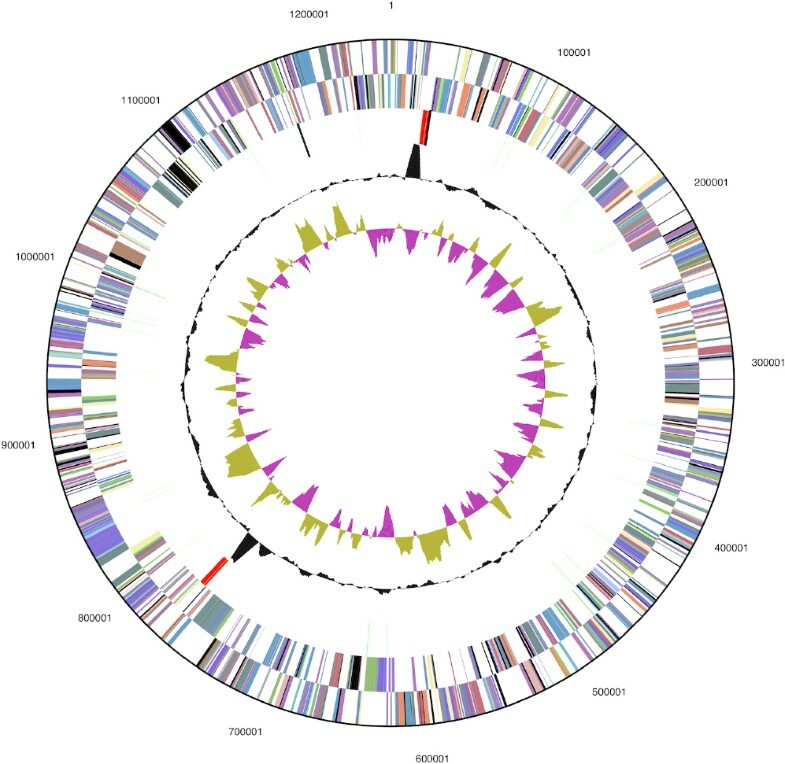 The highest sequence similarities of the strain V24ST 16S rRNA to metagenomic libraries (env_nt) were 87% or less (status August 2010), indicating that members of the species, genus and even family are poorly represented in the habitats screened so far. The 16S rRNA gene sequence of strain V24ST was compared with the most recent release of the Greengenes database using BLAST  and the relative frequencies weighted by BLAST scores, of taxa and keywords within the 250 best hits were determined. The five most frequent genera were Methanobacterium (55.3%), Methanothermobacter (23.5%), Methanobrevibacter (12.8%), Methanothermus (5.7%) and Thermococcus (1.7%). The five most frequent keywords within the labels of environmental samples which yielded hits were ‘anaerobic’ (7.1%), ‘sludge’ (4.7%), ‘microbial’ (3.7%), ‘archaeal’ (3.5%) and ‘temperature’ (3.4%). Besides ‘sludge’, these keywords fit well to what is known from the taxonomy, ecology, and physiology of strain V24ST. Environmental samples which yielded hits of a higher score than the highest scoring species were not found. The genome of M. fervidus contains two rRNA operons. One of these operons has a closely linked 7S RNA gene, encoding the RNA component of signal recognition particle . Phylogenetic tree highlighting the position of M. fervidus V24ST relative to the other type strains within the family Methanothermaceae. The tree was inferred from 1,249 aligned characters [3,4] of the 16S rRNA gene sequence under the maximum likelihood criterion  and rooted in accordance with the current taxonomy . The branches are scaled in terms of the expected number of substitutions per site. Numbers above branches are *support values from 100 bootstrap replicates  if larger than 60%. Lineages with type strain genome sequencing projects registered in GOLD  are shown in blue, published genomes in bold [9–12]. Figure 1 shows the phylogenetic neighborhood of M. fervidus V24ST in a 16S rRNA based tree. The sequences of the two 16S rRNA gene copies in the genome of Methanothermus fervidus DSM 2088 differ from each other by up to four nucleotides, and differ by up to 17 nucleotides from the previously published 16S rRNA sequence (M59145), which contains 87 ambiguous base calls. Although the cells of the strain V24ST do not contain a typical bacterial peptidoglycan, they stain Gram-positive. Cells are curved rods, 1–3 µm long and 0.3–0.4 µm in width (Figure 2 and Table 1), occurring singly and in pairs, with a doubling time of 170 minutes . Round, smooth, opaque, and slightly grayish colonies of 1 to 3 mm in diameter were observed on modified MM-medium plates containing trace amounts of solid sodium dithionite, sodium silicate solution and resazurin . Strain V24ST is strictly anaerobic and strictly autotrophic . Due to the low melting point of agar, strain V24ST could do not be grown on agar. Cells did not grow at temperatures below 61°C or above 97°C; the optimal temperature was 83°C . Growth occurs at a slightly acidic pH and equal to 6.5, while no growth could be observed at pH above 7.0 . In comparison, M. sociabilis grows at the temperatures ranged between 65°C and 97°C, with the optimal temperature at 88°C, its pH for growth being acidic to neutral (pH 5.5 to 7.5) . Strain V24ST produces methane from H2 + CO2, whereas acetate and formate are not used [1,27]. The addition of 2-mercaptoethanesulfonic acid (coenzyme M) enhances growth, especially when small inoculates are used . In artificial medium, yeast extract is required as an organic factor for growth . Strain V24ST gains energy by oxidizing H2 to reduce CO2 as the terminal electron acceptor [26,28]. At the time of isolation, strain V24ST was described to be nonmotile . Later, strain V24ST as well as M. sociabilis were described to be motile via bipolar peritrichous ‘flagella’, which was taken to indicate motility . These cell surface appendages, however, were recently determined to have a diameter of 5–6 nm, and therefore, very probably, represent not organelles used for motility, but for adhesion [R Wirth et al., unpublished]. The genome does not contain any flagellar genes. M. fervidus produces large intracellular potassium concentrations and amounts of 2,3-cyclic diphosphoglycerate, which are both thought to be involved in the thermoadaptation of M. fervidus [29,30]. Moreover, the DNA-binding protein HMf (histone M. fervidus), which binds to double stranded DNA molecules and increases their resistance to thermal denaturation, has been of interest in M. fervidus . A partial amino acid sequence analysis of the D-glyceraldehyde-3-phosphate dehydrogenase of M. fervidus shows high sequence similarity to the enzymes from eubacteria and from the cytoplasm of eukaryotes . This enzyme reacts with both NAD+ and NADP+ [32,33] and is not inhibited by pentalenolactone . However, the enzyme activity is low at temperatures below 40°C, but it is intrinsically stable only up to 75°C , which is interesting as growth of M. fervidus may occur up to 97°C . Also, the biochemistry of triose-phosphate isomerase, which catalyzes the interconversion of dihydroxyacetone phosphate (DHAP) and glyceraldehyde 3-phosphate (GAP) in the reversible Embden-Meyerhof-Parnas (EMP) pathway, has been studied to some detail in M. fervidus . The cell envelope of the strain V24ST consists of a double-layer of pseudomurein and protein, while the cell wall contains pseudomurein consisting of N-acetyl-glucosamine, N-acetyl-galactosamine, N-talosaminuronic acid, glutamic acid, alanine, and lysine [1,2]. M. fervidus contains approximately 50% diethers, 25% diglycerol tetraethers and 25% of an unknown component moving slower than the tetraethers when examined by thin layer chromatography . Here, M. fervidus differs from M. sociabilis, which lacks the unknown component while its diether and tetraethers were found at about equal proportions . The diethers of M. fervidus contain only C20 phytanyl chains while the tetraethers include about 98–99% C40 biphytane and only some trace of C40 monocyclic biphytane . Besides an unknown core lipid (FU, 31% of total core lipids, migrates slower than caldarchaeol by thin layer chromatography), other core lipids found in M. fervidus were caldarchaeol (60%), archaeol (4%) and others (5%) [35,36]. Interestingly, M. fervidus also differs from M. sociabilis regarding the glycolipid composition with four glycolipids and about equal proportions of five phospholipids and only three phospholipids for M. sociabilis . M. fervidus V24ST, DSM 2088, was grown anaerobically in culture vessels made of type III glass (alkali-rich soda lime glass) in DSMZ medium 203 (M. fervidus medium)  at 83°C. DNA was isolated from 0.5–1 g of cell paste using Qiagen Genomic 500 DNA Kit (Qiagen, Hilden, Germany) following the standard protocol as recommended by the manufacturer, with a modified cell lysis step. The modified lysis mixture contained only 100 µl lysozyme, but additional 58 µl achromopeptidase, lysostaphine, mutanolysin, each, for over night incubation at 35°C on a shaker. Proteinase K digestion was reduced to 200 µl for 1h 37°C. The genome was sequenced using a combination of Illumina and 454 sequencing platforms. All general aspects of library construction and sequencing can be found at the JGI website . Pyrosequencing reads were assembled using the Newbler assembler version 2.0.00.20-PostRelease-11-05-2008-gcc-3.4.6 (Roche). The initial Newbler assembly consisting of 24 contigs in one scaffold was converted into a phrap assembly  by making fake reads from the consensus, collecting the read pairs in the 454 paired end library. Illumina GAii sequencing data (636 Mb) was assembled with Velvet  and the consensus sequences were shredded into 1.5 kb overlapped fake reads and assembled together with the 454 data. 454 Draft assembly was based on 96.5.0 Mb 454 draft data and all of the 454 paired end data. Newbler parameters are -consed -a 50 -l 350 -g -m -ml 20. The Phred/Phrap/Consed software package  was used for sequence assembly and quality assessment in the subsequent finishing process. After the shotgun stage, reads were assembled with parallel phrap (High Performance Software, LLC). Possible mis-assemblies were corrected with gapResolution , Dupfinisher, or sequencing cloned bridging PCR fragments with subcloning or transposon bombing (Epicentre Biotechnologies, Madison, WI) . Gaps between contigs were closed by editing in CONSED and additional sequencing reactions were necessary to close gaps and/or to raise the quality of the finished sequence. Illumina reads were also used to correct potential base errors and increase consensus quality using a software Polisher developed at JGI . The error rate of the completed genome sequence is less than 1 in 100,000. Together, the combination of the Illumina and 454 sequencing platforms provided 605 × coverage of the genome. The final assembly contained 267,328 pyrosequence and 17,666,667 Illumina reads. The genome consists of a 1,243,342 bp long chromosome with a 31.6% GC content (Table 3 and Figure 3). Of the 1,361 genes predicted, 1,311 were protein-coding genes, and 50 RNAs; twenty eight pseudogenes were also identified. The majority of the protein-coding genes (74.8%) were assigned with a putative function while the remaining ones were annotated as hypothetical proteins. The distribution of genes into COGs functional categories is presented in Table 4. This work was performed under the auspices of the US Department of Energy Office of Science, Biological and Environmental Research Program, and by the University of California, Lawrence Berkeley National Laboratory under contract No. DE-AC02-05CH11231, Lawrence Livermore National Laboratory under Contract No. DE-AC52-07NA27344, and Los Alamos National Laboratory under contract No. DE-AC02-06NA25396, UT-Battelle and Oak Ridge National Laboratory under contract DE-AC05-00OR22725, as well as German Research Foundation (DFG) INST 599/1-1. The Phred/Phrap/Consed software package http://www.phrap.com.